The Marker Airbrush product from Crayola is like no other toy we have played with before! It’s such an innovative idea that combines art with play! My little 6 yo budding artist got such a kick out of the CRAYOLA Marker Airbrush Set. He was able to create flawless works of art like a pro! It was simple for him to operate (it’s completely ‘kid powered’ – no batteries required!). You can turn Markers into Spray Art! Genius! Then place a stencil over paper & spray until your little hearts content! The Kit includes Fabric Markers too! We created art for t-shirts! Create your piece of art by spraying – we used all of the colours! Then remove your stencil to reveal your masterpiece! The colours are so intense it’s incredible! Let it dry, then either place in the dryer for 30 minutes on the hottest setting or iron the reverse side of the design for 4 minutes with a back and forth motion! You’ve just Airbrushed your very own wardrobe! Crayola have kindly provided us with THREE of their Marker Airbrush Kits to GIVEAWAY to THREE lucky Fun Mums!! “What is your child’s favourite creative activity”? Place your answers in the comments section below – it’s that simple! *see full T&C’s outlined at the bottom of this post. Open from Friday 15th August 7.00pm – Friday 22nd August 11.59pm (EST). 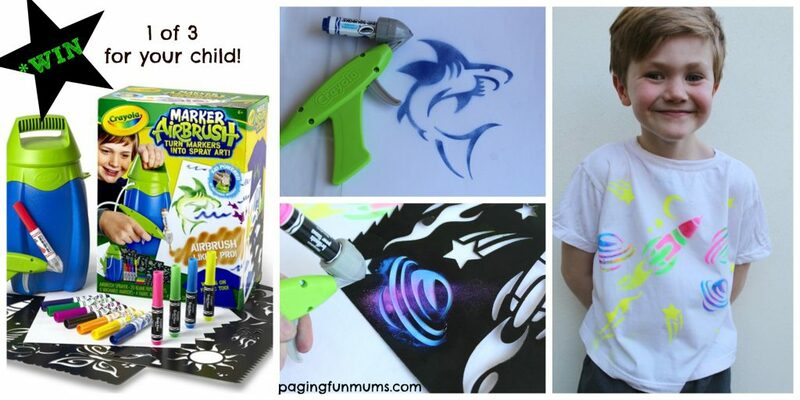 Win one of THREE *‘Crayola Marker Airbrush Kits’! The promoters are Jenni Ferguson & Louise Thomsen t/as Paging Fun Mums Buderim, QLD 4556. ABN 98 256 176 896. The giveaway is open to Australian Residents only, persons who are aged 18 years and over and must be able to show proof of age and residency. The winner will be selected from all eligible entries at 9.00am on Monday the 25th of August by Paging Fun Mums. The winner will be notified via email and will have their full name published on this post on Thursday 28th August 2014. In the event of an unclaimed prize, an unclaimed prize draw will take place on Monday 28th September 8.00am (EST) at the same place and via the same method as the original draw. The unclaimed prize draw winner will be notified in writing within 2 days. The winner’s details will be published on this post on Thursday 28th August 2014. To enter entrants must comment under the giveaway image on Facebook, then head to the Paging Fun Mums website and in 25 words or less write a creative answer to the following question – “What is your child’s favourite creative activity”?. Entrants agree to the terms listed here and participation in this promotion is deemed acceptance of these Conditions of Entry. Employees of Paging Fun Mums ”the promoter” and members of their immediate families and agencies associated with this promotion are not eligible to enter. The winner of this prize and all aspects of the competition is final and binding on every person who enters. No correspondence will be entered into by Paging Fun Mums. A potential winner may be requested to provide the Sponsor with proof that the potential winner is the authorised account holder of the email address. By entering this giveaway, you agree to be bound by these Official Rules. Entrants further agree to be bound by the decisions of the judges – Paging Fun Mums, which are final and binding in all respects. Paging Fun Mums reserves the right at their sole discretion to disqualify any individual it finds to be: tampering with the entry process or the operation of the sweepstakes or website; to be acting in violation of the Official Rules; to be acting in violation of Paging Fun Mums Terms of Service; or to be acting in an unsportsmanlike or disruptive manner, or with intent to annoy, abuse, threaten or harass any other person. Our winner confirms by entering this competition to have their full name disclosed/published via the website listed above, once the winner has been confirmed. No personal details such as email particulars, telephone details, date of birth, street address etc will be revealed at any time. No purchase is necessary to enter.The promoter is responsible for the issue of the prize only, and but is not liable if the prize is lost, stolen or damaged in transit. The prize is not transferrable or redeemable for cash. If for any reason this competition is not capable of running as planned, including due to infection by computer virus, bugs, tampering, unauthorised intervention, fraud, technical failures or any causes beyond the control of the Promoter, which corrupt or affect the administration, security, fairness or integrity or proper conduct of this promotion, the Promoter reserves the right in its sole discretion to disqualify any individual who tampers with the entry process, modify or suspend the competition, subject to any direction given under the State Regulation. The prize will be sent free of charge to the residential address of the winner, and not ℅ – a business address or third party, at no charge within Australia. FACEBOOK DISCLAIMER This promotion is in no way sponsored, endorsed or administered by, or associated with, Facebook. You are providing your information to Paging Fun Mums and not to Facebook. The information you provide will only be used for communications related to this promotion and other future offers from Paging Fun Mums relating to the various products that they sell or endorse. I’ve been doing crafts with my grand daughter (7 yrs old) she loves drawing and painting. My kids love anything to do with drawing and dancing ! They love to paint everything & anything !!!! My 7 yr old daughter loves loves to draw and paint. Sometimes not on things she supposed to but its how she expresses herself. Pretend play is definitely my son’s favourite way to be creative right now. He spent today wearing his monkey tail! My kids love working with playdoh making diorama’s. Anything they can do together! Dressups, drawing or even making ‘snails’ out of playdough! Both my kids love to draw and will happily draw all day, my eldest is starting o explore painting as well. Finger painting. Creative, tactile and oh so messy! Pure bliss. Yesterday my daughter made me a windchime from a heart block, feathers, sticky tape and coloured string. It’s so beautiful made my day! My little monkey loves drawing. Even know it looks like a whole lot of lines and squiggles she can tell me what it is. At the moment my boys are really enjoying painting. At the moment my daughter loves draining, painting and cutting. Anything arty/crafty, but I think it’s about to be the Crayola Marker Airbrush. Even if I don’t win – how awesome does it look?! My daughter loves drawing, painting and cutting out her artwork. Little miss 4 loves to cover tissue boxes, we wrap her artwork around them. For presents to family. Mstr6 and baby brother just finished plaster of Paris hand and foot prints for Daddy next he wants to decorate a frame for them. My two kids made their own letter boxes last week and now make each other ‘awards’ which are then delivered with great ceremony. My boys have been asking for this for ages now, they love craft & would love to win this prize. Grandkids love to draw things and color in the picture they love to create new drawings to play guessing games. My grandkids lastest fun at Grandma’s is marshmallow painting on pre made animal cookies! We microwave marshmallows with a dash of water, place spoonfuls in a muffin tray & then add food colouring in to create edible cookies. Many, many, many chalk drawings on our driveway. Making playdough. They love to make it themselves and create the colours that they want. Keeps them occupied for hours. My daughter loves to take sheets of different stickers and use them to colour in pictures in colouring in books. I think she’s very creative! My son loves drawing huge pictures all over our driveway using chalk. My favs creative kids craft is making something from boxes crafty things and using it in pretend play. My little princess is a little artist anything to do with crafts and she is happy. My 4yo son loves anything that envolves drawing. At the moment he loves drawing his daddy in the fire truck. My kids love making puppets – from socks, newspaper, play-dough, toilet rolls, anything. Then there’s a competition to see which puppet has the funniest voice. Kids love coloring and drawing, painting… Anything that is messy really.. Drawing Painting arts and crafts but fav is painting cloths so crayola marker airbrush will be perfect to decorate our projects. A box filled with coloured paper, glue, glitter, scissors, stickers, pipecleaners, pom-poms, ice block sticks and so on, along with their wonderful imagination. My Grand Children when with me they loves arts and crafts, Coloring, Painting, Puzzles, popcicle sticks, anything that is creative. Anything that lets them get messy,painting,sensory play,mud play. My girls all love to draw……..they sit for hours drawing the most amazing drawings! My son loves to collect different shaped rocks. He also loves to draw patterns and faces on them. My kids love to paint, they love mixing colours to see what they can make, they love the mess and using imagination! My children love art and craft activities. They create art masterpieces, enjoy writing their own stories and love playing schools together. My daughter loves colouring in, this would make her imagination run wild, wouldn’t mind a go myself too. My daughter loves to draw and paint. She gets very excited when she discovers which colours mixed together make other colours. She also loves to cut and glue to create artistic masterpieces. My little boy loves to draw, play with playdoh and will spend hours doing craft. He has a vivid imagination. His favourite part is gifting his creations to loved ones. Is loving anything to do with paints!! Finger painting, brush painting. And even on the windows and it just washes off !! Playdoh, he likes squishing it, the colours and to create objects of his favourite animal/shape/cartoon character of the day. My daughter is love with craft, she loves to stick collage to paper, boxes, anything she can get her hands on. My hubby is a computer guy and gets heaps of boxes and packing stuff she always steals that and makes cars trains robots which we are in the process of doing. My daughter is completely obsessed with anything to do with drawing and painting it is unusual to see her with out a pencil and paper. My 12 year old Son loves and awesome at writing stories. His last one like 9 pages long and so good better then adults!! Role playing involving dress ups. Anything from doctors, mums and dads, school teachers to princesses and princes. Anything that requires glue and getting messy! This would be something my grandson and his dad could enjoy together…..
My child loves to draw and paint and create. My kids love to paint! With brushes, stamps and fingers. They can’t get enough. My four children love any activity mommy can come up in her head, whether it be scavenger hunts at home or face painting for no reason at all. I know my daughter especially would love thus airbrush device and she always loves to look for DIY projects we can do together. All my children love to paint and draw. This would be great for another tool to express their colorful imaginations. My son loves to draw and create incredible stories through his drawings..his imagination is fantastic! My children love doing everything crafty, whether it be painting, gluing, drawing, etc. Drawing and painting always has and always will just give him a piece of paper and let the creativity begin. My 3 boys love playing with their washable footpath chalk to create different worlds – then hosing it off and starting again! My boy loves to draw colour in he will sit there for ages..
my daughter loves to do crafty stuff and love to draw and learning how to write..
My 3 year old loves to make towns (dinosaur towns & people town etc) using cardboard, tins, paper, paper plates etc than he will colour it with paint, texters and crayons. He has a great imagination. My daughter loves writing comics. The drawings are so beautiful and creative! My grandsons would love this. They love to draw and be creative. Play dough is always popular- making food and having pretend parties with it or designing new types of animals ( and trying to make them stay standing up). Oops, too many words! Can I delete that last phrase? My 7 year old considers herself a crafter. She is always designing and making crafts, accessories for her dolls and what not, using clay, paint, glue, markers, duct tape, you name it. She is a clever crafter and never fails to amaze me. Drawing still art from everyday oblects around her ! My 3 year old loves doing any arts and crafts! She would absolutely love this!!! Both my girls love to paint and draw with Crayola, makes art so much fun for kids and so much easier for Mums! My kids love building huge cardboard castles in the backyard and painting them. Hours of fun!! My children love all craft but nothing is more fun than painting, painting with brushes &painting with yours fingers! My son loves to dive in (almost literally) to the recycling box and find paper or card, even toilet rolls, and build his own characters! My little ones love to draw and colour. hair bows, vases, fairy wings. She is really crafty minded. She’s my little skillful diamond! My oldest just loves drawing. Everyday new and fabulous pictures are created. I love her imagination. The ideas she comes up with consently surprise me. I babysit my grandchildren on a regular basis and on rainy days we love to colour in and finger paint .this would be a great prize. Knitting – because it is a wearable art! Painting – when it comes to being creative, my son is ‘quick on the draw’! my kids love getting out on the driveway with chalk and drawing up a big mural or playing hopscotch! Play-dough, finger painting and building sandcastles – really anything that breaks the ‘no mess’ rule! Finger painting…the walls….with his dinner. At the moment play dough is the in thing….this allows them to bring out their creativity using their imagination to come up with wild and wacky designs. My daughter right now is addicted to making masks! She loves colouring them in and measuring where she needs to cut out the eye segments. She can easily spend 2 hours just sitting down creating one mask! Our kids love painting with shaving cream mixed with food dye – it creates lovely works of art and our kitchen walls are full of their amazing artworks! My kids (boy, 2 and girl, 7) love sparkly things and love doing drawings then sticking sparkly stars or glitter onto their work. When we run out of sparkly things we simply cut up aluminium foil and stick that on paper instead! My daughter loves sketching characters.She is now gone from black & white to coloured sketches. My 2 year old loves painting with bubbles. My daughter loves 3D craft. Making people out of boxes etc and making them places to live. I have a 7yr old boy and 4yr old girl and I think our new favorite thing to do is the glitter snow….its awesome!! My 3 year old loves doing anything with her 12 year old sister to feel like a big girl. This Crayola Airbrush set means they could play together- hopefully peacefully! Brushing, flicking printing fun and play, My children love painting in each and every way! My kids love to make play dough creations and display them in a clear plastic box. My children love to draw. Their creations are amazing! My son has ADHD and very few things hold his attention. But painting and Lego do. My son loves ANYTHING that involves drawing/cutting/glueing. Have lots count how many times I have awoked to kitchen full of new artworks. My son loves to play with Legos and erector sets. He is Very creative with a vivid imagination. He also spends a lot of time drawing and sketching. He would love to have this airbrush set. Give my daughter as much paper as she wants and you wont see her again until she has finished an amazing drawing. Drawing. With imagination, the sky is the limit. My almost 10 yr old has rediscovered Legos. He will sit for hours recreating things from his favorite games and books! All three love colouring in, but if I was lucky enough to win this great prize, I would give it to my mother-in-law as she has recently started drawing and would be over the moon with it. Oops, just answered in over 25 words so will try again. They love colouring in, and my mother-in-law loves drawing. A paint brush and a bucket of water = hours of free entertainment painting cement outside. My girls love scratch art where they scratch a design into the top layer to reveal rainbow colours underneath. Then they scratch it ALL off!!!!! My Grandchildren just love coming over and doing all sorts of craft at my house, this prize would be fantastic! Will currently loves being creative in the kitchen. He puts a little bit of this and a little bit of that and wella perfect cake. My son Levi who is 5 years old loves his lego creations, and unbelievably good at it. Would love him to experience airbrushing. My kids love to paint. Watercolour. Normal paint. Finger paint. They would go nuts over this. My children love doing craft, making birthday cards or personalised cards for any occasion. It’s cute and sentimental to the person receiving it. My girls love cutting up paper into tiny bits, and after glueing some of them, leaving the rest in a beautiful collage on the floor. My 5 year old is constantly creating books out of paper where she drawers the pictures and together we write the story. Finger painting! Oh this would make things a little less messier! My son is starting to learn to read and write so he has created a letterbox for himself and for me out of shoe-boxes (decorated it himself) and he likes to leave notes or drawings of his favourite things in which I then return with my own note or drawing. My son is new to writing so he’s designed a letterbox from a shoebox and leaves notes and drawings to myself of his favourite things. My son loves to draw and create. He is not impressed with outdoor play time at preschool preferring to say in and draw. My 3 boys love lego and making all sorts of creations. They love drawing pictures for their stories they make up. Simply to draw until their heart’s content. My son and daughter love to draw and cut out their drawings than paste them onto coloured paper! Both my boys 6 and 4 years love painting and using glitter, they are both very creative and we have not yet done any airbrushing. Both my boys 6 and 4 years love painting and using glitter, they are both very creative and we have not yet done airbrushing. My daughter loves drawing with anything she can find. She even uses both hands. I have a tree full of drawings all through my house. My son loves to draw play with his cars colouring in with his big sister doing craft . My kids have ADHD. They are always on the go. I think this will help us to get them to sit down so we can do something as a family. Thank you. My children love to draw , paint, and color every chance they get. I have three beautiful babies. They are all very different my 10 year old love to paint, my 6 year old loves to color and decorate and my 3 year old loves things he can do by himself (chalk , pouring glitter) but something they all enjoy together is marker fun and tie dyed shirts! My daughter weslee loves to color and write! Galia loves to make painting and drawing for every one. She stay with the project for a while she really lovea it. My daughter loves paint and playdoh. My grandsons are here often. My son , their dada passed away last year. When I have them we play lego, and have art shows. I try to do as much fun things as possible on a no income level. They would love to have this. I can just see them now making new art for the art show. We hang them all over the house then we let family come and see the art gallery. My kids love painting rocks and placing them all over the garden. My 7 year old likes drawing on her white board and pretending she’s the teacher to her dolls and teddies lined up on the floor! My 6 yr old boy has a massive box full of “making stuff” (junk) and he cuts glues sticks till his hearts content. Drawing. My eldest loves to draw. His form of release. My daughter loves doing anything crafty but is always wanting to paint lately. My kids love creating their own little worlds, colouring and creating big boxes into fairy worlds, frozen lands and lego lands. My Grandson is focused on making trucks, trains and diggers using the assortment of various sized boxes available, he is nearly 3. My son loves anything crafty, especially drawing & painting. My 5 grandchildren love crafting together anything when they come to visit. They love the Crayola stampers to make cards for everyone. My children love making little films for you tube my favourites would have to be the adventures of Agent Silly Pants and Captain Lollies. Likes to decorate my windows with either blowing raspberries or trying to pass the double coated Timtams threw the window. I have 4 kids and they love to play Knights and princess’s so we spend a lot of time making swards and shields and dresses. My son loves painting and keeps asking for spray cans to paint a canvas. An airbrush would be a awesome for him. My daughter loves all things creative but at the moment she loves writing and illustrating her own books…and making costumes! my 6 year old loves to be a teacher. she is making the whole family complete her school work. we also love to draw and make creations together using recycled materials and lots of craft. My little sister is 7 and we are arts n crafts crazy can’t get enough crayola!!! My son is curious and always loves to create something with nothings. He loves to create and see the pride in our eyes!! My grandson loves to paint & he would spent hours creating masterpieces with this airbrush! My niece is especially creative – she loves doing all kinds or arts & crafts but anything involving paint is always a winner with her! Not so much with her mum but its a small price to pay to see that beautiful smile! Dreaming to be a fashion designer. Sneaking into my sewing room taking a pick of fabrics. My daughter loves making pop out story books and colours them in, using Manila folders as the base of each page. My son loves colouring strictly with Crayola products only, he gets so focused on his work it’s adorable. Joshua 8 is very crafty in the bathroom,when taking a bath he wets the cotton balls then throws them up onto the roof. My little boy loves drawing anything he’s interested in and making whatever his idol Mister Maker teaches. My daughter loves to draw and paint. She loves useing old things from around the house. Trifun spends hours making dinosaurs and dragons out of paper and curling ribbon. An inexpensive, imaginative pastime. My little miss just loves to do anything that is crafty. Can not name a little one, if I was lucky enough to win, this would be going to the Princess Margaret Hospital Christmas Stocking Appeal, to put a smile on a little ones face over the Christmas period. Thankfully my daughter loves doing and making anything creative. I especially love her big, bold abstract paintings. I’m an airbrush artist and the kids would love to paint along mummy’s side. My sons is art. He loves to creat things and he loves to draw he is very creative. At the moment it’s a close tie between loom band creations and drawing everything and anything! Both of my children love to draw and are much better than me! My daughter loves all things crafty and trying out new crafts! My boys draw n cut out people to make teams family’s etc I’m forever finding cut out n drawings in there room. Imagine what they could make with this. Anything crafty. She loves drawing, painting, making, loom bands, colouring. any thing to do with carft is what my kids love to do the best. My son loves painting and drawing and using fabric and different materials would show him a whole new level that he would love to spend hours doing. Our two year old ‘Mini Matisse’ daughter loves drawing with crayons and watching the colours ‘pop’ out when she washes over them with watercolour paint. My daughter Salome loves to draw and create things she is always drawing or looming. Emma (6) is a MEGA arty little girl, this would be amazing for her, I bet her friends would love the tshirts she would make! My little boy loves colouring and cutting & pasting! Some even saving the nation. My five year old Ella loves to make art out of anything. Whether it’s drawing or painting, or making pictures and patterns out of other objects. She would LOVE this. My three and a half year old Grandson would love this!! Paint, crayons, markers, chalk. If it makes color he’s on it. My son is very creative and artistic. We are always looking for new outlets for him to express this creativity. This would be awesome. My son Elijah would absolutely love this! He is so creative and loves drawing and painting. This would be an awsome thing for him as i know he would love it. I only get my boys every second weekend and they love drawing etc. it would be wonderful for the three of us to do together !! So much fun would be had !!! My daughter just love painting. she will settle down, spend hours paint and scribble and draw anything. she loves creates a story with her painting. Jaysan is always drawing, he’s only 2 but is very artistic for his age. He also loves watching me cook sitting on the kitchen bench. My son loves his Lego. He will sit and build, destroy and build again many times. Lots of adventures to be had. My two girls just love to create and craft…..they would spend hours on this it looks like so much fun. Think I would have to give it a try to it looks so good. My Grandson loves to paint presently it’s mothers makeup used this would be just what he needs Please help mum out, save her makeup. my little great neice loves to draw. When max isnt performing for the world, dancing, acro or just in the lounge room with singstar, he is drawing and creating beautiful artwork! My niece is at the age where she is exploring her creativity and this would give more opportunities to develop her ideas. My nephew would love this, he started school this year and has turned into such a creative little man. Eve loves to paint, colour and draw. She loves to give her art to family and friends. My son enjoys making scenes for his lego and hero figurines. This involves him using lego and drawing different scenes. My son very creative with drawing pictures of anything especially superhero characters. My lil girls favourite activity is craft!! Cutting, gluing, sticking stuff!! Loves being creative!! My son loves getting outside climbing trees and riding his bike. We’ve recently been having fun making paper mache. Its cheap, my son loves doing it and something we can do together. We’ve just made a made a paper mache dinosaur egg piñata for my younger sons birthday and my older son loved painting and decorating it. Making paper mache. Its cheap, fun my son loves making it and its something we can do together. He enjoys painting and decorating it. my daughter loves to draw a picture then we tell stories about it. great for her speech development. I would love to make this a gift to my niece Pepper who loves to design beautiful dresses for Princesses. For Ryder and of course, me too. He loves to build things out of leggo and then he makes a story out of it. We buy cheap canvas pumps/shoes and my 8 year old designs her own shoes. My 8yo loves modelling with clay and playdoh. She enjoys the challenge of making them stand upright. My daughter loves craft, painting and decorating t-shits, The perfect gift for her. My son loves to paint most but he also loves any craft activities where he can make and create he would love to win this☺☺☺!!! Making little creatures with air dry clay, animals, monsters, aliens and people. Creating a wonderland of splash paint and cotton wool blot. Creative and beautiful one of a piece. My son loves to act out stories with his lego. Making box animals, people etc with anything they find & painting them. And collages with things from anywhere we visit. At the moment it’s people chains out of paper, you know the one’s where you fold a sheet of paper accordion style, draw a human form cut it out and it’s a chain of people holding hands, well them. Then he spends ages drawing clothes and faces on them, usually they’re members of the family or friends, sometimes even the neighbours. Keeps him out of trouble. Crayola have the most creative art and crafts for kids. My toddler loves making butterfly bracelets (because his older sister does). It’s so cute seeing them run around the house flapping their butterfly wrists! My granddaughter loves arts and crafts always drawing and making things.And crayola is the best brand hands down, all of their products are great. My childrens favourite creative activity is making an outfit, shoes and all from newspaper and sticky tape! My daughter loves painting paper on her easel, the BBQ, her little sister, the poor dog. Anything she decides needs a splash of colour! Little Miss in this house loves to get creative in the kitchen. She loves to try and make her brothers lunch for school, she loves to decorate cupcakes, help me make biscuits and ice cakes. It sure keeps her happy, maybe she’ll turn out to be a chef! I would love to win this for my amazing godson! He loves painting his favourite show is mister maker, he would be in love! My godson would love this, his favourite show is mister maker he would be so in love with this! My boy loves making superhero accessories, he favourite, a Power Ranger accessory which he made out of cardboard sticky tape and a paper towel roll. She loves abstract drawings and collage. Meagan is 7and a half she amazes me everyday with her imagination and creativity. My daughter is very creative and goes through crafting phases. She is currently obsessed with creating stuffed animals out of felt with her mummy. Amara-lee would love this as dad airbrushs she would have the best of fun joining in with daddy. She loves Colouring/drawing. My daughter loves to stick stickers everywhere ! My little boy loves to colour in and paint ! Chalk drawings on the driveway – she can be as creative as she wants, and if she wants to start again it can be washed away with the hose! Im the proud grandma of a beautiful grand daughter aged 6-7. ]We spend or time doing all sorts of craft work.We also do colouring to-gether and lots of drawing.If we were to lucky enough to win one of theses we could make some Christmas presents and have hours of enjoyment . My boys love the sandpit,making castles, pretend sand “cakes”and would love to play with Crayola Marker Airbrush. Our kids love doing finger painting. The messier, the better is their philosophy! My niece loves to colour in….and so do I. It’s so relaxing. ‘Painting’ our brick wall with water. Keeps them entertained for ages, especially on hot days when their ‘paint’ dries quickly! My children like doing coloring in , origami , and puzzles . My Twin Great Granddaughters aRE ALWAYS COLOURING IN OR DRAWING, SO FAR i AM YET TO KNOW WHAT THE DRAWINGS ARE, BUT THEY CERTAINLY KNOW. This would be a lovely gift for them. Olivia is a little artist. She can sit for hours painting and drawing. My little man loves drawing, painting, writing everything and anything bright, colourful and arty, this pack would be well loved and used by him. My daughter loves to glue things (feathers, sequins etc) to her drawings (loving oil pastels at the moment). definately playdough and gluing,cutting and pasting things! My son Taylan would love this. Our son loves constructing things with boxes and pieces of cardboard – even more than playing with expensive, regular toys. My 6 year old son enjoys doing puzzles. Also, he loves constructing “buildings” with paper and sticky tape. My little miss loves drawing with crayons, pencils, textas. Painting, ripping colored paper and pasting all different colors all over the card. Our new fave is dying pasta and buttons and some string making necklaces and bracelets. My child loves drawing. Her favourite things to draw are flowers, animals and fairies. She can spend hours creating beautiful pieces of artwork. 🙂 My little artist! Making a mess, in any form! The more colourful, the messier, the better! Does looming count?! At the moment that is their creative activity! Lol they also love to draw! We make home made cement paint. My sons love using it to be creative and to add some colour to the driveway. The best part is it washes away. My son loves to paint, anytime of the day or night! My daughter loves cutting paper up and making shapes & snowflakes with her designs. The crayola whiteboard / dry erase board. To practice her writing on, as she is just learning to write her name. All over the kitchen walls and door! He loves using his Crayola glow in the dark dome in his room. Creating underwater adventures or space adventures at night. My daughter loves doing anything to do with art and craft. Loves making things and also trying new products. Loves everything! My kids love painting, gluing, cooking, anything tactile that allows them to get their hands dirty and use their imagination! i have started a face painting program and i’m 13 and i would love to have this and the kids would love it. my children love doing hand and foot prints with me using lots of Beautiful coloured paint. My girls love recycling cereal boxes, plastic pots, paper, and anything else they can find to create, build, & invent. My son and I sit down and watch ‘Mr Maker’ and then make exactly what he has, its great fun! My kids love drawing adventure stories- starting on one edge of the paper and drawing our way through forests, over mountains till we’re home again. Helping to decorate cakes and biscuits in all weird and wacky ways. We’ve used the stencils from some of little tacker’s toys to help decorate, which he absolutely loves! He loved painting and building, so he combines both with any materials he gets his hands on as often as he can. At the moment, little Miss four likes to create her artwork on the walls. No matter how many times she is told no, I still manage to find her drawings somewhere. He loves painting and then pouring copious amounts of glitter all over the artwork. She likes to cut, glue and make. Turns into a robot wearing socks. For activities, they’re never looking. Even when outside, it’s with rain! She loves using all things Crayola to create a world of magic and where dreams come true, Imagination is creation. Absolutely anything that keeps his little hands busy from daylight to dark. Anything involving arts and crafts where both children and adults can play and create together. Play dough, my son creates a world within a world. my eldest loves graffiting his books shoes stickytaping everything even his sister while she leaves her masterpieces everywhere! and uses anything to paint even poo! My kids love to dig and play in the garden, collecting, digging and watering the veggie boxes! We make maps..to go every where this would be so cool to make one on a shirt…My house..to Nana’s drawing trees..houses..lakes …what ever else a child can imagine..
My little girl loves drawing and painting on anything, but luckily also likes to clean it up herself afterwards! Can’t wait to do arts n crafts with my grandson. Oh the possibilities!!! Anything that involves cutting, gluing, pasting and colouring and not necessarily in that order. Outside making mud pies, sand creatures & anything else he can think of! Grass clipping monsters! I’m a nanna to 7 children we all love arts and crafts, making and creating all sorts of things. Isabella loves all arts and crafts type projects. I think her favorite thing to do is grab some crayons and draw a picture for her aunts and uncles to hang on their fridges. My step daughter, 6, loves making cards to write “I love you” to decorate with glitter and stickers and to send to grandma and grandpa who live interstate. my grandchildren love anything to do with craft . they would love this product as it would keep them happy for a while.